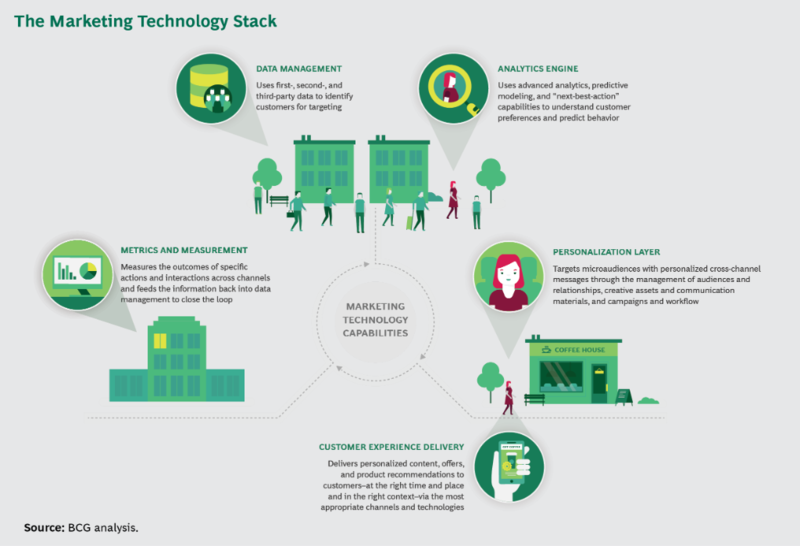 The amount of data available to personalize customer experience has exploded – demographics, transaction data, interaction history, behavior, location, and preferences – to name just a few. Prioritizing the data by value creation is critical but difficult. Managing channel interactions requires specialized tools – tools to manage communications, tools to personalize web pages, tools to manage social media content, tools to support customer service, tools for delivering personalized experiences across channels – the list is daunting. Most of the available tools have no capabilities to interact with each other. Communicating across channels requires multiple levels and layers of content – a task that can be particularly challenging to small and medium enterprises. Measuring and interpreting the interactions across channels is incredibly complex and optimization may look like an impossible goal. Even a small organization may end up using over 20 tools in its marketing function. Identify the key use cases that the technology must support. Marketing technologies lend themselves well to agile development, and the embedded iterative nature of the task provides constant scope for improvement. Develop an end-to-end marketing technology map. Organizations must look at the personalization ecosystem they’re trying to create in its entirety, from data management to advanced analytics to customer engagement, all the way through to measurement and optimization. In general, marketing resources are organized by specific skills and tend to be siloed. Thus, synergy is lost. Select the best-in-class tool for every individual function. Advantage: Provides the best functionality to each element. Disadvantage: Sub-optimal integration. Implement an integrated marketing cloud suite. Advantage: Integration across different elements. Disadvantage: Compromises functionality in certain areas. Create a blueprint and pick core vendors. Organizations would do well to build the stack incrementally rather than trying to build everything at once. Bear in mind that switching costs tend to be very high and the lack of interoperability may result in crippling bottlenecks. It is worth noting that failures are usually the result of applying old habits to a new technology. Technology is just one of several enablers that include data, people, process, skills, and culture. SaaS cloud-based solutions, that support an agile approach, are becoming the standard for most parts of the stack. Many organizations anchor their marketing stack on a main cloud suite and augment it (via buy or build) with additional components to support specific functions based on business context and priorities. While there are many marketing automation, content management, and channel delivery options available that perform well when configured correctly, one of the most difficult decisions is how to set up the analytics engine. Given the value of optimizing the “brain” of the marketing tech stack, instead of opting for a “black box” engine that can be quickly deployed but is more difficult to optimize, large organizations find it worthwhile to build or buy a set of solutions that gives them control over the inputs to the analytics engine. This does not mean that they must invent the algorithm frameworks from scratch (open-source libraries for most of these frameworks are readily available), but it does mean that they must design the analytics engine, so they can customize the algorithms, data features, and business rules.